The web has provided another proof of our family rule that it is impossible to compete with unintentional self-parody. The day after GM’s preposterous congressional testimony and its release of the unintentionally hilarious Valukas report detailing GM’s criminal indifference to human health and life a libertarian blogger featured GM’s cartoon version of von Hayek’s “Road to Serfdom” to warn us of the fact that democratic government invariably leads to serfdom. As a further act of unintentional self-parody, the blogger chose the 70th anniversary of D-Day to post GM’s cartoon. The cartoon’s premise is the supposed absurdity of the government being competent to plan anything. It is worth noting (a) that the folks who planned the invasion were government employees, (b) that the plan they drew up was extraordinarily complex, (c) that the plan was highly creative, particularly in its deception as to the place and timing of the invasion(s), (d) that the government planners embraced risk (while also seeking to reduce many risks), (e) that the planners adjusted rapidly and radically – and embraced even greater risk – when weather caused a delay in D-Day and offered a reasonable possibility that a narrow window of barely acceptable weather would occur on June 6, 1944 that would permit the air and sea elements to invade Normandy, (f) that the government planner/commander-in-chief took personal responsibility for the decision to risk a June 6 invasion (and composed the famous letter taking personal responsibility for the failure of the invasion), (g) that the plan achieved strategic and tactical surprise, (h) that when some of the plan’s assumptions (inevitably) proved incorrect due to intelligence errors or incomplete intelligence and due to (inevitable) mistakes in execution the planners and government employees (soldiers, airmen, and sailors) responded creatively, vigorously, and courageously to the mistakes and errors and improvised revisions to the plan, (i) the government employees accomplished each of these things in a struggle against a rival government employee who also displayed exceptional planning competence (Field Marshall Erwin Rommel), and (j) the plan worked even when terrible storms destroyed or severely damaged the innovative port facilities created pursuant to the original plan (the logistical aspects of the plan were more complex and difficult than the exceptionally complex and difficult troop movements that are more familiar to non-specialists like me). Victor Davis Hanson, the ultra-right classicist (who I criticized in a column earlier today) is a historian who has studied World War II. In sum, the libertarian blogger has an atrocious sense of timing to post a cartoon prepared as propaganda by GM – the self-described incompetent customer killers who had to be saved by a public bailout – that attempts to ridicule the government’s ability to plan – on the 70th anniversary of one of the greatest triumphs of government planning in history. My take, to date, on GM’s most recent crimes can be found here and here. 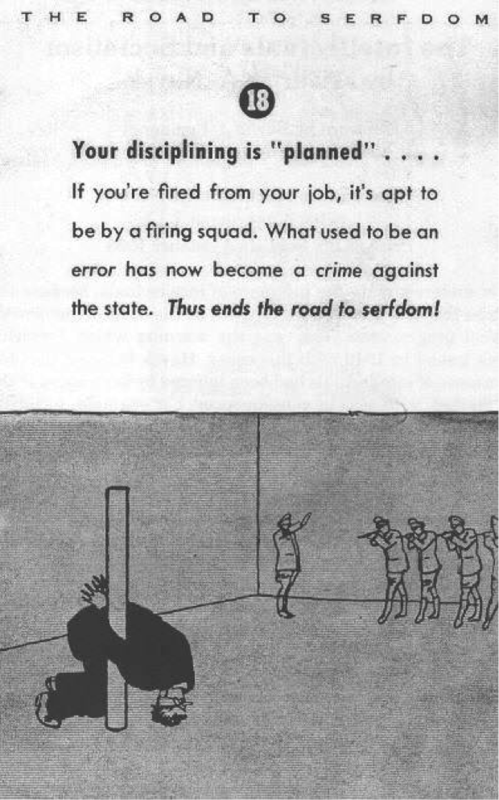 As to the GM’s cartoon version of “The Road to Serfdom,” the obvious response is that none of its predictions proved true. As the classical economists understood, government laws and rules are an essential prerequisite to effective and honest markets. No liberal (as that word is used in the U.S.) nation has become a fascist state as a result of the terrible sin of “planning” despite GM’s portrayal of that progression as inevitable. The effort to demonize government regulators and to replace them with libertarian anti-regulators like Alan Greenspan did, however, prove immensely criminogenic and has, in conjunction with the troika’s attacks on workers reduced many workers to a major loss of economic and political power. Similarly, because the Obama administration refused to use the leverage provided by the government bailout of GM to clean up the rot in GM’s management (and planning) GM was able to continue is depredations for another five years. I confess that I have never been able to take von Hayek’s fantastic claim that democratic government invariably leads to serfdom seriously. I think the reduction of von Hayek’s comic book level reasoning to cartoon format is a great example of unintentional self-parody by GM. GM’s cartoon reveals the three great fears of GM’s executives, which are presented in GM’s last three cartoon frames. In frame 16 we are warned of the horrors that will happen if the media are not owned exclusively by corporations. 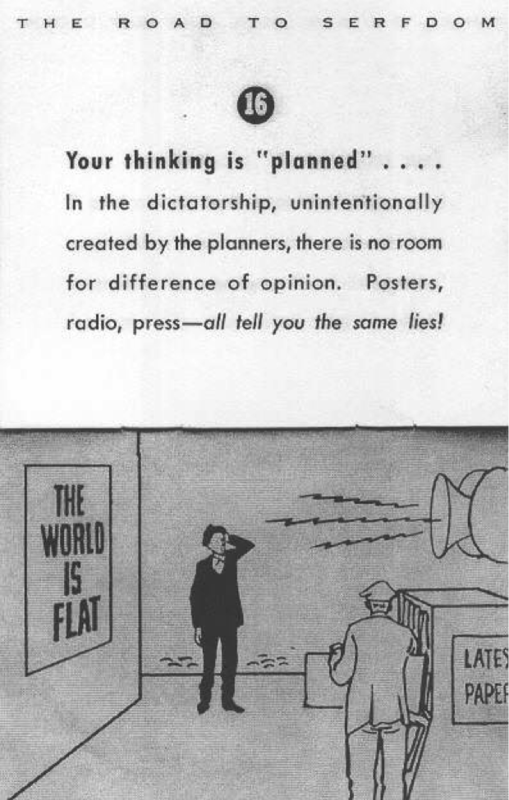 Any government planning leads inevitably to “dictatorship” and all media will spread “the same lies.” The banner headline in the government media is “The World is Flat.” (GM’s ability to foresee the horrors of being force fed a steady diet of Thomas Friedman fantasies is uncanny.) Frame 16 is a fabulous example of unintended self-parody. The claim by GM’s senior executive that “climate change is crock of s***” is a classic example of “flat earth” thinking. GM also contributed to the global climate deniers at Heartland. In frame 17 we are shown a true horror (at least from the perspective of GM’s senior executives). 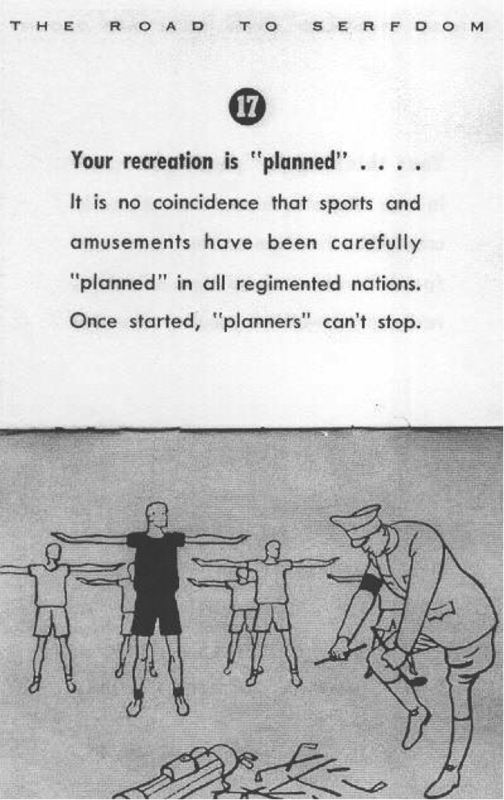 The frame warns that once someone in the government is allowed to plan anything they inevitably plan everything, including recreation. The frame shows a government worker dressed as a Nazi breaking golf clubs shafts over his knee while we, the people, are reduced to regimented calisthenics while wearing plebian t-shirts and athletic shorts. When I was growing up in Dearborn, Michigan, GM executives were famous for their love of golf. Frame 17 portrays GM’s executives’ most primal fear – no more golf and being forced to wear K-Mart clothing while associating with the plebian riff-raff. Oh, and GM entered into joint ventures with or investments in two Japanese automobile manufacturers that required workers to wear uniforms and engage in morning mass calisthenics. Frame 18 is the last slide and in it we learn that the inevitable result of democratic government is: a firing squad (dressed as Nazis) executing businessmen and workers. This entry was posted in William K. Black and tagged criminogenic, GM, Road to Serfdom, von Hayek. Bookmark the permalink. You’ve fallen for a common misperception. “The Road to Serfdom” was an aspirational, not a cautionary, title. Incredible! I look forward to the second bankruptcy of this monstrosity. Time to scrap them all. Yes, Hayek aspired to the fascist dictatorship outlined in the book. Well, Hayek certainly “aspired” to the un-democratic fascist military dictatorship in Chile, didn’t he? “… when Hayek visited Venezuela in May 1981, he was asked to comment on the prevalence of “totalitarian” regimes in Latin America. In reply, Hayek warned against confusing “totalitarianism with authoritarianism,” and said that he was unaware of “any totalitarian governments in Latin America. The only one was Chile under Allende”. Since Allende was democratically elected, we may conclude that, for Hayek (and modern so-called “libertarians”), democracy is totalitarianism and authoritarianism is freedom.